K-Line’s Dual Powered Road Trains —K-Line Trailers today announced production has begun on their third and fourth Dual Powered Road Trains (DPRT) for an international mining corporation’s Canadian operation. 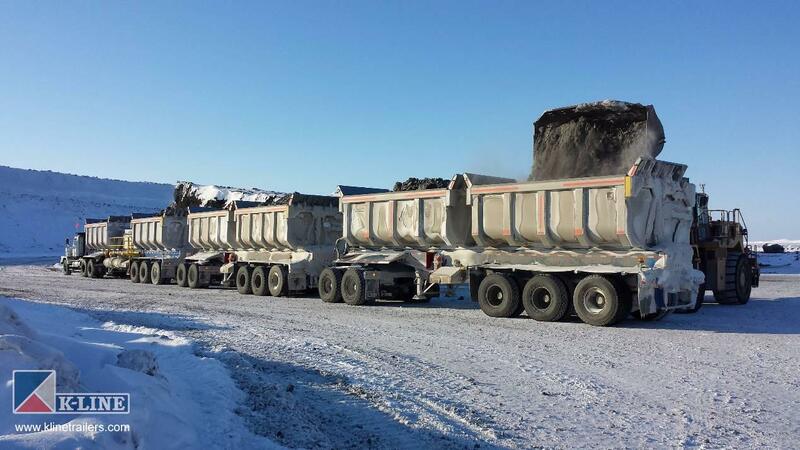 The mine’s current fleet of Dual Powered Road Trains are hauling some of the highest long-distance payloads of material in the North American mining industry. “Our goal was to bring a truly game-changing product to the North American mining industry. With our customer’s confidence in expanding to a K-Line DPRT Fleet earlier this year and their recent order for more DPRT’s in 2017 (with a projection for more through to 2023), it confirms we have been successful with that.” said Les Knight, CEO at K-Line Trailers. In 2014, K-Line Trailers upgraded its previous powered trailer design for triple trailer weights and manufactured what is believed to be the only Dual-Powered Road Train operating in North America. K-Line’s DPRT transports an amazing 216 metric tonnes (476,000 lbs.) on grades up to 10% and handles more material at higher speeds than conventional haul trucks. The 190’ Dual Powered Road Train partners a formidable tier 3 540HP CAT engine and planetary drive axles with the proven reliability of Western Star’s powerhouse 600 HP Detroit DD16, 6900XD Off-Road Tractor. The CAT engine and Western Star tractor work as one unit to make this a remarkably seamless experience for the drivers on the mine’s long haul road. According to John Tomlinson, Western Star’s North American XD & Vocational Sales Manager, “Driver training and safety orientation are much simpler than one might initially think for a unit of this size. If a person has driven an A or B-Train configuration before, then they have the advantage of driving in a familiar environment behind the wheel of a Western Star Tractor. It’s an easy step from there to operating the road train”. Following the implementation of the first DPRT at the mine in 2015, K-Line’s design and fabrication team continued to work closely with the mining company to fully integrate the DPRT to the mine’s operations, safety, and maintenance programs. K-Line Trailers commitment as a leader of innovative transport design and manufacturing is built on their ability to respond to challenges and work with customers to find new ways to deliver the right product for their environment. Photos and footage of K-Line’s Dual Powered Road Trains are available for download at www.klinetrailers.com. Founded in 1994, K-Line Trailers is a top trailer designer and manufacturer for Mining, Heavy Haul, Aggregate, Wind Energy, and multiple other transport sectors.